Last year, I sat in the theater and watched the travesty that was called Transformers: Last Knight. It became my worst film of the year and in the top 5 worst of all time. I so hated that movie. The other Transformers films were bad, but that thing was just horrendous. So, to say that I was excited about seeing another Transformers movie, this time focused on the single Transformer, Bumblebee would be a gross exaggeration. However, with director Travis Knight at the helm instead of Michael Bay, there was a glimmer of hope that they could find the missing ingredient to make the movie worth seeing. I wasn’t holding my breath. Then, positive word of mouth started coming from critics, and I was cautiously optimistic. Not hopeful, just optimistic. Today I saw Bumblebee. It is easily the best Transformers live action movie that there ever was and I would argue that it would give the classic animated movie a run for its money. This gives us the origin story of Bumblebee, starting on a war torn Cybertron. Optimus Prime sent his dedicated soldier Bumblebee to earth to scout out if the planet would work as a base for the remaining Autobots. Bumblebee was to protect the earth from the Decepticons and keep it secret. Bumblebee landed on earth in the middle of some war games from military man Agent Burns (John Cena) who immediately tries to destroy the robot. Bumblebee winds up in a junkyard for an uncertain amount of time. 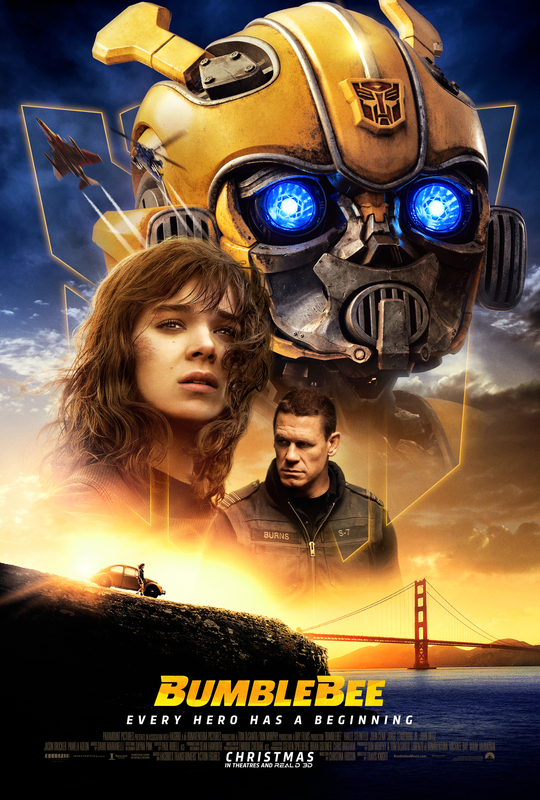 When teenage girl Charlie (Hailee Steinfeld) discovers the yellow Volkswagon-looking Bumblebee, she takes it home and then discovers that the Volkswagon bug was more than met the eye. The relationship between Charlie and Bumblebee is the crux of the film. They are remarkably sweet together and this film creates a real and human person to interact with the Autobot, unlike any of the Michael Bay movies. Hailee Steinfeld shines in every scene as the outcast teen who had suffered a terrible loss that has shaken her life to the core. Bumblebee helped fill that gap. Meanwhile, two Decepticons (voiced by Justin Theroux and Angela Bassett) discover a signal from Bumblebee and trace it to earth. They team up with Agent Burns to try and capture the renegade Transformer. I have heard some negative comments about John Cena’s work in this movie, but I thought he was great. He was actually very funny and had some of the best lines of the movie. I will admit that he does feel like someone who fit more in the old Bay movies than this one, but I think he has a place here. The battles are exciting and considerably easier to follow. One of the biggest problems in the other films was you never knew who was fighting who because it just seemed like big robots fighting. These fights were well shot and directed beautifully so I cared about watching them. Charlie had a good dynamic with her family as she was doing her best to keep them at arms length. The screen time that these characters received were all well done and furthered the story. This movie was sort of a prequel to the other films and was set in the 1980s (specifically in 1987) and the film did not hide the fact that it was the 80s. Songs were constantly blaring in the film of the greatest hits of the decade and we got allusions to the Breakfast Club. They were anything but subtle with their references. I enjoyed the music, even though there were a few stretches where it felt more like a music video than anything else. I love 80s music so this was fun for me. There were allusions to the Bay series of movies as well as the Transformers: The Movie. Although it was challenging at times because the movie Bumblebee played fast and loose with the continuity during this movie. This is completely fine with me. I would be all for pretending like those other movies did not happen and building a new continuity starting with Bumblebee. This is the best Transformers movie ever and it owes a great deal of thanks to director Travis Knight. The film is extremely engaging with Steinfeld and Bumblebee and has a pretty basic, yet successful story. Optimus Prime was perfectly used here. This is what Transformers fans have been wishing for since the beginning.